TORONTO, May 30, 2018 /CNW/ - Treasury Metals Inc. (TSX: TML) ("Treasury" or the "Company") is pleased to announce additional assay results from the active infill and resource expansion/exploration drilling program at Treasury's flagship Goliath Gold Project located in northwestern Ontario. The Company has three objectives in this drilling program, which include: 1) exploration drilling of a downdip potential expansion of the high-grade shoot within the C zone; 2) infill drilling to convert resources and increase confidence in targeted areas within the Main Zone; and 3) exploration drilling along strike and northeast of the proposed open pit. This is a continuation from the drill program that commenced at the beginning of 2018 in which 11,591m in 17 drill holes have been completed up to and including this release. Successful results from these targets would enhance the current resource within the mine plan for the upcoming Feasibility level design studies and help define targets for future expansion. A drill hole location plan map and longitudinal sections for the Main and C Zones are provided at the end of this release. The Company has commenced the 5,000 meters of resource expansion/exploration drilling on Treasury Metals' East Resource Target, in an area not in the current mine plan. Initial drilling results from the program will be released in June, 2018. "The Goliath Gold Deposit remains open at depth and has significant potential as demonstrated by the recent high grade gold intersections at greater than 500m depth. 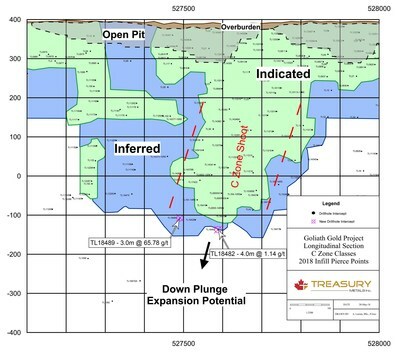 While we continue to advance our Pre-Feasibility Study, with a planned July release date, we will continue to advance our exploration program in order to provide the most robust resource we can for the upcoming Feasibility Study as well as to demonstrate the growth potential of Goliath at depth and along strike to the NE," said Chris Stewart, President and Chief Executive Officer of Treasury Metals. "The East Resource Target drilling program is progressing well and we are also planning to do some surface work around the banded iron formation and fold nose structure on our property this summer as we believe there is significant potential in this area and our objective here is to put together a regional exploration program for 2019." The title hole of this release, TL18-489, intersected 65.78 g/t over 3.00m following up on nearby historical holes TL161-14RE which returned 5.47 g/t over 4.00m, TL17-422 with 4.10 g/t 5.00m, and TL16-420 with 2.72 g/t over 6.00m (see attached C Zone image). The Company is encouraged to see mineralization at the bottom of the C zone shoot, which is located behind the Main Zone. Further drilling in the area may delineate new gold ounces into inferred resources and eventually the mine plan. The Company's recent Main Zone drilling is targeting key locations within the mine plan to convert resources from inferred category to indicated category. TL18-474 is located in the west high-grade shoot, which is the least densely drilled shoot, and intersected 7.56 g/t over 7.00m. TL18-478: intersected gold mineralization in three sections in close proximity: 5.26 g/t over 2.00m, including 1.00m @ 9.93 g/t, 4.77 g/t over 3.40m, including 1.00m @ 15.10 g/t, and 0.82 g/t over 6.00m. Other highlights include TL18-471A from the bottom of the eastern shoot which intersected 1.91 g/t over 13.30m and TL18-478, located on the western edge of the central shoot, which intersected several gold intervals across the Main Zone, including 5.26 g/t over 2.00m, 4.77 g/t over 3.40m, and 0.82 g/t over 6.00m. Technical information in this press release has been reviewed and approved by Adam Larsen, P. Geo, who is the qualified person under the definitions established by National Instrument 43-101. All results from the program will be available for viewing in the Complete Assay Table on the Company's website. Treasury Metals Inc. is a gold focused exploration and development company with assets in Canada and is listed on the Toronto Stock Exchange ("TSX") under the symbol "TML" and on the OTCQX® Best Market under the symbol TSRMF. Treasury Metals Inc.'s 100% owned Goliath Gold Project in northwestern Ontario is slated to become one of Canada's next producing gold mines. With first-rate infrastructure currently in place and gold mineralization extending to surface, Treasury Metals plans on the initial development of an open pit gold mine to feed a 2,500 tonne per day processing plant with subsequent underground operations in the latter years of the mine life. The Company has implemented a quality assurance and quality control (QA/QC) program to ensure sampling and analysis of all exploration work is conducted in accordance with the CIM Exploration Best Practices Guidelines. The drill core is sawn in half with one-half of the core sample dispatched to Actlabs facility located in Dryden, Ontario. The other half of the core is retained for future assay verification and/or metallurgical testing. Other QA/QC procedures include the insertion of blanks and Canadian Reference Standards for every tenth sample in the sample stream. A quarter core duplicate is assayed every 20th sample. The laboratory has its own QA/QC protocols running standards and blanks with duplicate samples in each batch stream. Additional checks are routinely run on anomalous values including gravimetric analysis and pulp metallic screen fire assays. Gold analysis is conducted by lead collection, fire assay with atomic absorption and/or gravimetric finish on a 50 gram sample. Check assays are conducted at a secondary ISO certified laboratory (in this case AGAT Laboratories located in Mississauga, Ontario). Metallic screen fire assaying is now completed using a 2.0 kg sample and four 50 gm fire assays of the pass (-100 mesh) pulverized material.